New Southam United boss Alex Baird. Southam United have named Alex Baird as first team manager. 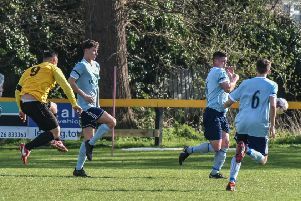 Baird replaces Ian Ray whose final match at the helm of the Midland League Division One’s bottom club was a 15-0 defeat to Racing Club Warwick. Baird has played more than 450 games at Step 6 or above, reaching the last 16 of the FA Vase twice and the fourth qualifying round of the FA Cup once. He has also won the North West Counties Division One title as well as helping West Didsbury and Chorlton to their highest ever league position while winning the league cup with them. Since moving to the Midlands, Baird has played for Coleshill Town, Atherstone Town and latterly Southam United who he joined as a player a year ago before moving into a player/coach role. He is currently recovering from a serious knee injury and does not intend to play again. Chairman Charles Hill said: “We had a good number of very credible candidates for the post but, after deliberation, it was evident that the most viable candidate was Alex. “He has already shown 110 per-cent-plus commitment to the club and commands the respect of the existing squad but is realistic in knowing that certain key additions are needed if we are to have any chance at all of avoiding relegation through our onfield efforts.